Tokens for games are an essential part of carnival game play. Tokens or tickets are provided to encourage children (and adults) to play their best. Players feel better about themselves if they try to do something, succeed and then get a small token as a reminder that they did good. Games are challenging but rules are designed for different skill levels so all players have the same fair ability to earn tokens. Schools that do not permit children to earn tokens are doing a disservice to the children and sending them the message that honest, real work does not really count. Games played with the ability to earn and then trade in the tokens are more exciting and keep them coming back to play. See our website FAQ about tokens for information about how to use tokens for real world skills and math lessons at every grade level. 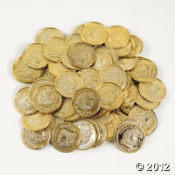 Tokens can also be used to 'win' a pizza party or ice cream social for greatest classroom participation. Ask us how!